... or at least, on their own. Some of these are big "No-No"s, others, maybe alright for layering. Naturally soft and pointing straight forward when they are not shielding my eyes (pointing downwards). Easy to curl, as they are very thin and soft, but doesn't hold curl especially in the moist local climate. Quantity of lashes are few, quite sparse. Some lashes are decently long, but others are tiny and hard to find. 1st trial, 11-Mar: Straightens my curl, shortens my lashes (if that's possible), no added volume. 2nd trial, x-Jun: Straightens my curl very very badly. No added length nor volume. 2nd trial, 12-Mar: Holds the curl, blackens lashes, no added length, no added volume, smudges after 3 hours. Overall: If this holds better in my climate, I'd use this as a layering mascara. 3rd or 4th trial, 19-Mar: Holds curl, volumises a bit. Possible for layering. Wand: It should be the rubber spiky type. Chanel Inimitable "10 Noir Black"
1st trial, 19-Mar: Too wet, straightens my curls. 2nd trial, x-Jun: Still too wet (?). Straightens my curls. Good thing: no clumps and lengthens a little... I curled it again after it dried, applied another light coat, and it looks pretty decent. Didn't smudge. Wand: Lovely rubber-spiked brush. Easy to use and catches my tiny lashes. Overall: If I had stronger lashes that doesn't fall straight so easily, I could use this. This is okay as a layering mascara for me. Helena Rubinstein Lash Queen Feline Black "01 Black Black"
Wand: The traditional bristle type, looking at the cross section, bristles are shorter on two sides, and longer on the other - like an oval shape. 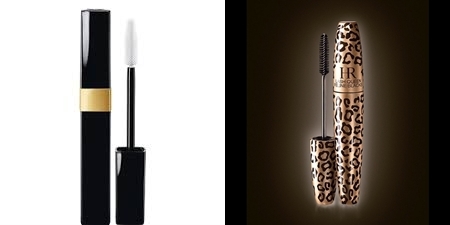 Overall: When I purchased it, I primarily bought it for its packaging (I'm a pathetic collector of leopard and cheetah prints), and secondarily, for the reason I have never tried Helena Rubinstein mascaras. The first purpose has served me well, I am delighted every single time I see it. The second part, I'm impressed. It is not often for me to find international or Western brand mascara that works okay, this does, in terms of curl holding, lengthening and volumising. However, I need the WP water-proof version as this does smudges after 2 or 3 hours wear. I hope you find this little 'disappointing' review helpful. If you have similar lash or climate condition as I do, perhaps these mascaras are to skip or avoid. What are some mascaras that you can't use? You're welcome, Eugenia. That's right, what doesn't work for me might work for others! My absolute favourite is Max Factor Clump Defy Mascara waterproof. I have very short eyelashes and they don't curl up nice enough, too soft. I found the MF clump defy gave me amazing volume! I'm currently having about 10 mascaras switching up on a daily basis! I see... just read your blog, seems like MF clump defy is still too 'natural' for my liking!